Naomi Woolfson, Embrace Bump to Baby, explains how you can experience a calm birth. If you have watched the video compilation of the gorgeous photographs Emma took of Sebastien’s arrival into the world (read birth photography blog here) you may be wondering how the birthing mama looks so calm and collected throughout even though she is birthing in a pool in her living room! The answer is quite simply that a woman’s body is designed to give birth. 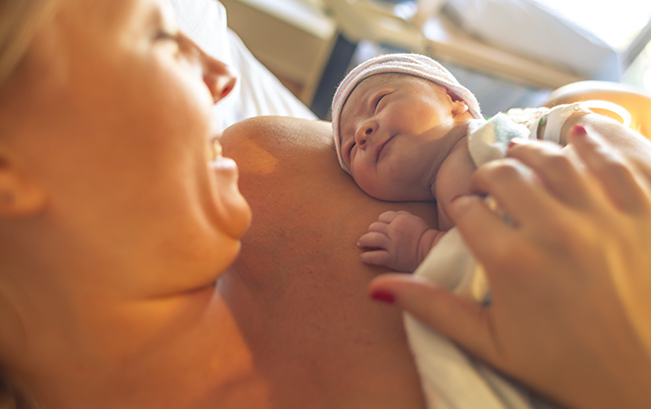 Part of the natural process of birth involves her body releasing endorphins and oxytocin our natural painkillers. But what about the negative stories I’ve heard? Anxiety and stress during labour can halt the natural process. Your uterus has three layers of muscle that work together to thin and open the cervix and push your baby down. If they are supplied by a healthy flow of oxygenated blood they work by contracting and then releasing in surges. If a woman feels stressed or anxious during labour she will not feel safe, her body will go into stress response releasing adrenaline and cortisol into her bloodstream. Blood that is needed by the uterus in order for her contractions to be productive will be pumped to her arms and legs in order for her to run or fight the perceived danger. Her body will not be focused on birthing. This causes the muscles of the uterus to become tense and tight so that rather than working effectively they are pulling against each other which can cause pain. Stress or fear can also cause a labouring woman’s oxytocin level to plummet dramatically, slowing down her contractions, or even stopping them completely. How can I best prepare for my baby’s birth? Get educated. Read up on how your body is designed to birth, watch lots of positive birth videos of other women birthing with power to counterbalance any negative stories you may have heard or seen on TV or in films. Build a trust in yourself and your body that you can do this and then allow it to happen on the day. I have created the Embrace Bump to Baby course to do just that. I teach a combination of techniques that include hypnobirthing and acupressure to give you tools that you can utilise in advance and on the day of your baby’s birth, enabling you to work with your body instead of against it. The course will support you in clearing any fears or doubts and teach you how to enhance those feelgood hormones that will allow you to birth with confidence when your baby is on his or her way. The course is an online video course so you can access the content to suit your lifestyle. To find out more and read positive birth stories visit www.embracebumptobaby.co.uk. Studio Bambino can highly recommend Naomi Woolfson, Embrace Bump to Baby (who kindly wrote this blog for us) and Saveria at Nesting Mums to introduce you to hypnobirthing.